It’s been about a year and a half since Alyn Williams opened his self-named restaurant at The Westbury Hotel on Conduit Street, during which time the restaurant has increasingly grown in fame. And no wonder. For five years Williams was the head chef at Marcus Wareing’s restaurant at The Berkeley Hotel where he was instrumental in helping Wareing win two Michelin stars. Foodie establishments have also acknowledged Williams’ prowess, with Michelin awarding him a one star and The AA Three Rosettes. The restaurant is is decorated in a style that becomes a restaurant in a 5-star hotel. It has an elegant feel to it with lots of soft furnishings, warm brown colours and soft lighting. It might be stuffy for some, elegant for others. I liked it, although I despaired at the size of the table leg that was almost as broad and wide as the table itself. It was like a tree trunk and left virtually no room for your feet to land. It didn’t create the most comfortable space in which to sit. But the reasonably priced menu at Alyn Williams at The Westbury heals all wounds. To be sure, £60 is not an insignificant amount of money. 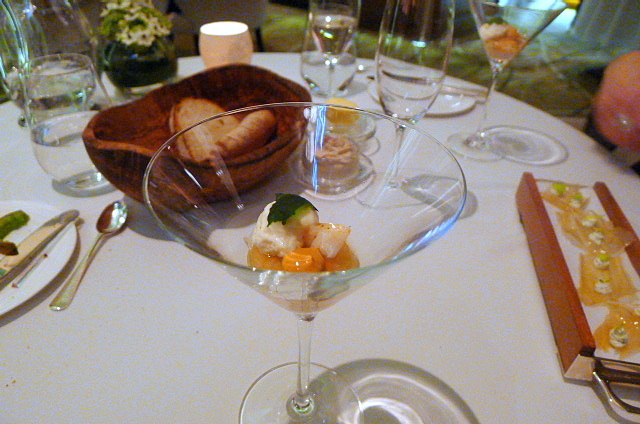 But £60 for a seven-course tasting menu cooked by a Michelin starred chef in the heart of Mayfair is good value indeed. In fact, it’s probably the best value Michelin tasting menu in London. Both the vegetarian and non-vegetarian tasting menus are available throughout the week, but the à la carte menu (three courses for £50) is only available for dinner on Monday through Thursday. 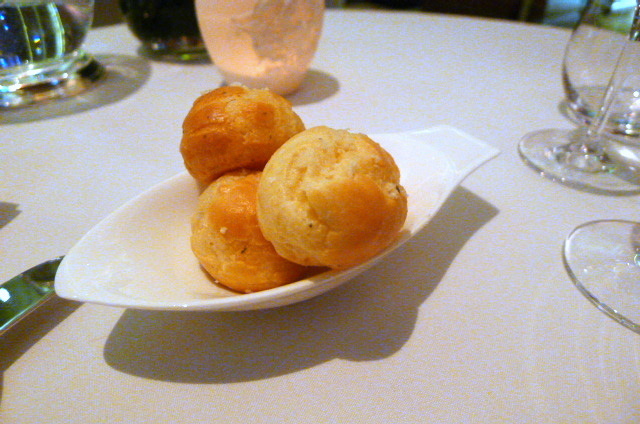 To kick off, we were presented with some gougères while we reflected on the menu and decided on drinks. These had been gently warmed and were light and fluffy with hints of blue cheese running through them for a savoury flourish. 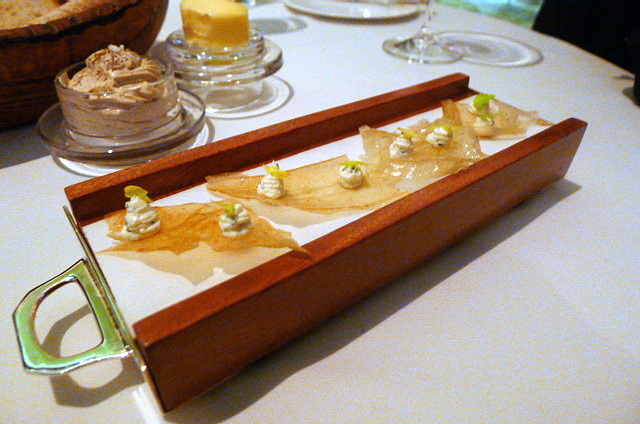 Petit fours included flavours of crab served in a martini glass containing crabmeat infused with milk, crab jelly, a crab cream and a parsley crisp. For the final touch, a crab infusion was poured into the glass at the table to enhance the sweet crab flavours of this little taster. On a separate tray were also some celery crisps topped with cream cheese. The combination was nice, and the crisps were delicate and thin with a gentle hint of celery. 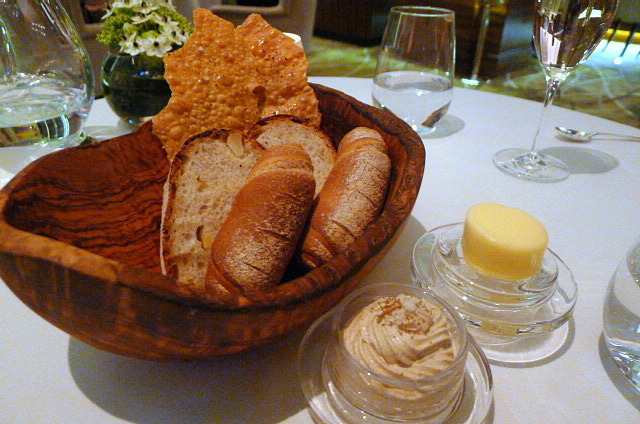 The breads were fabulous, and included stout beer with aniseed, a potato sourdough and a salt and pepper crispbread. To accompany the former was a whipped caraway seed butter that worked well with the beer. The potato bread was also lusciously tasty and contained small pieces of whole potato. 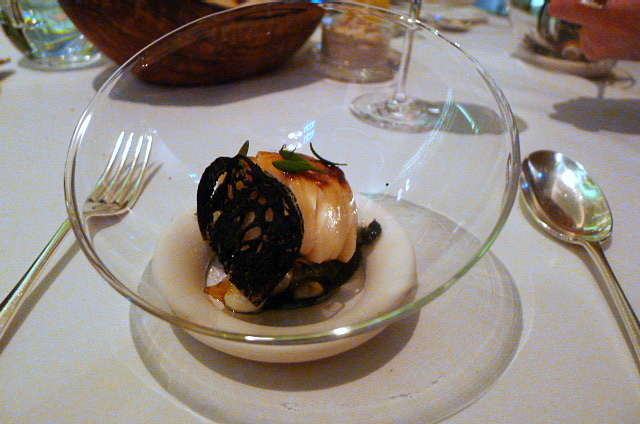 The first course in the tasting menu was an Orkney scallop that was divine. Boasting of a succulent sweet flavour, it had been beautifully cooked with an opaque centre. Served with very tender slivers of cuttlefish and a crouton of squid ink, the only minor let down of this dish was the saltiness coming through from the squid ink sauce. A quail marinated with olive oil and fennel seeds was very tender. First poached then roasted, it was pleasantly appealing, but on balance I would have enjoyed it more if it had been seared and served medium rare. It came with a fantastic baked potato purée, interesting for both its potato flavour and wonderful smooth texture. A smoked egg, cooked sous vide at 65c and then lightly smoked, yielded a lovely runniness. To round of this satisfying dish were some pickled red cabbage for a touch of acidity. Cod, slow cooked in a thermodyne, was glorious. It was decadently moist, soft, and flaked easily. 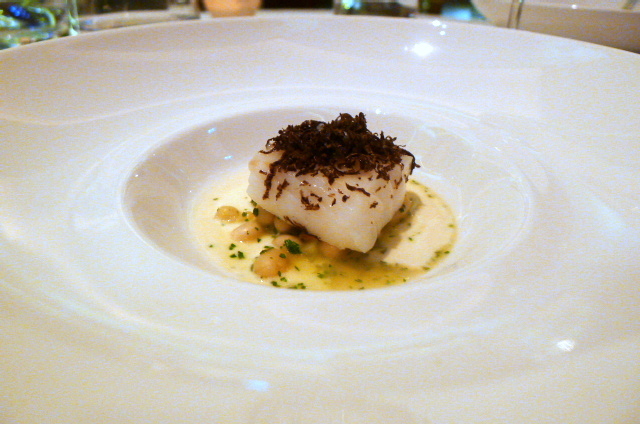 It was served with coco beans, shavings of winter truffle and a fish veloute finished with pastis. This was a great dish, but the veloute was also a touch salty. We each went for the alternate main options. First was the Devon ruby red sirloin that was meaty and robust in flavour. 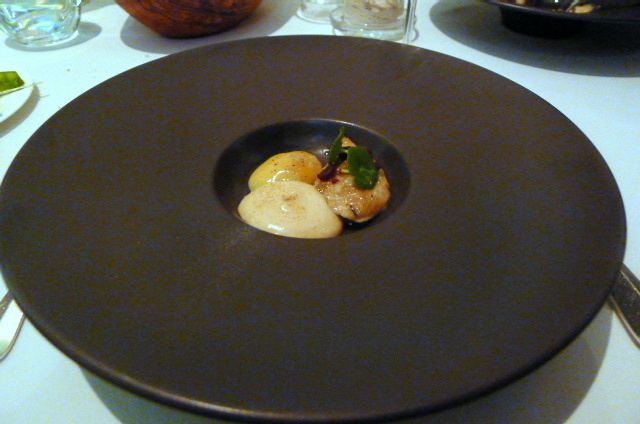 Accompaniments of boulangere, turnip and some earthy pied de mouton (mushrooms) were good. There was an interesting garnish of foraged scurvy grass, which with its mustardy flavour gave a boost to the dish. It was a nice course, wonderfully executed, but it didn’t quite produce the wow factor. 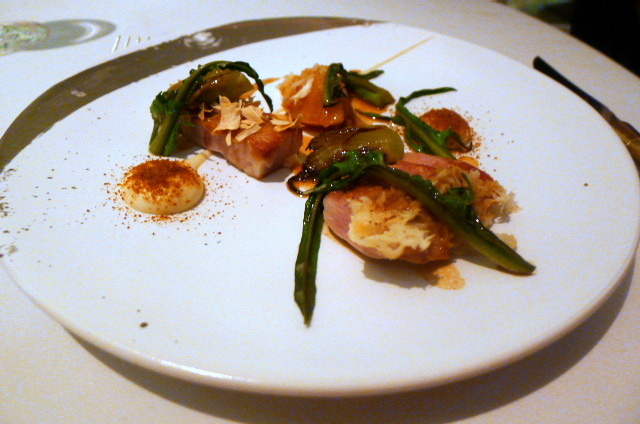 The second main was a 50-day aged middle white pork cooked two ways (loin and belly). It was truly flavoursome, and the sweetness of some quince worked well with the pork. Parsnip, chicory and liquorice added further depth to the dish. A pre-dessert of delicious Cornish cheesecake with a Yorkshire rhubarb granita and little pieces of ginger crunch, was delicious. 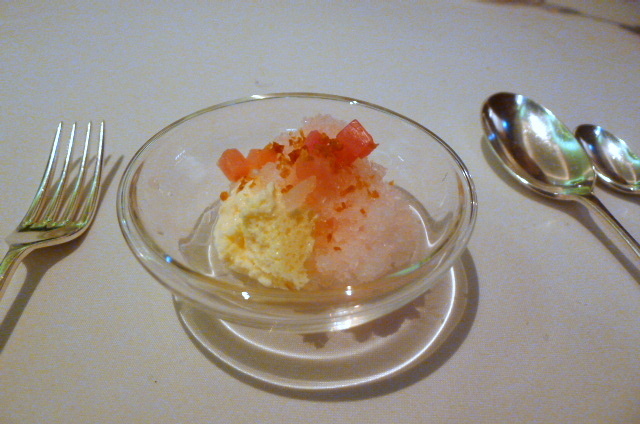 The creaminess of the cheesecake melded well with the zingy overtones of the granita. Dessert was an Acorn infused crème Catalan. It was creamy and smooth, although the Acorn didn’t really add much in terms of taste. 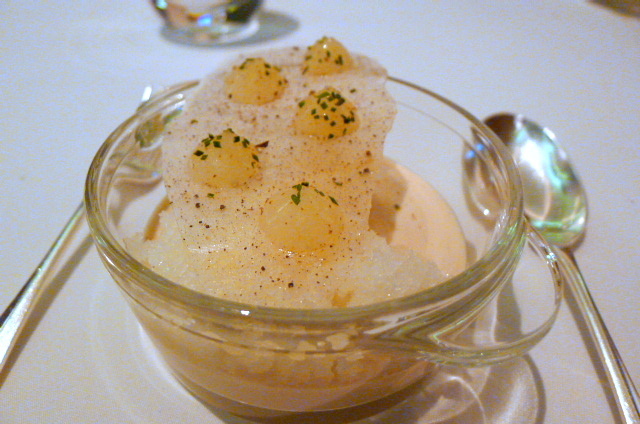 A pine granita, pear and winter truffle tuile completed this dessert. It was a pleasant pudding, but it didn’t really capture the imagination. 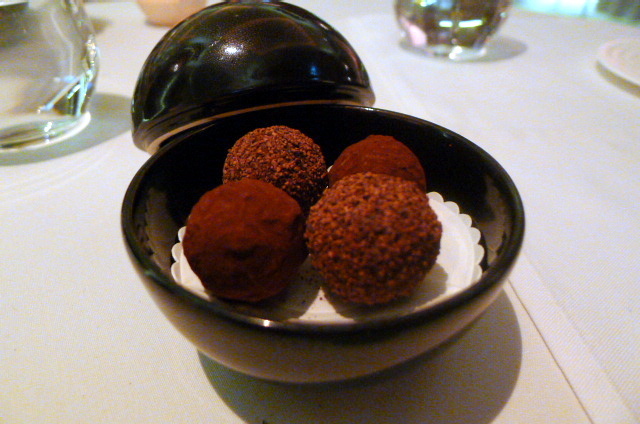 To finish the meal were some salted caramel, and Pedro Ximénez with espresso chocolates. The balance between the salt and caramel wasn’t quite there, almost, but not quite. With the latter, you couldn’t really get the taste of the alcohol as the espresso was quite strong. These were good chocolates and with a bit of tweaking they could have been perfect. 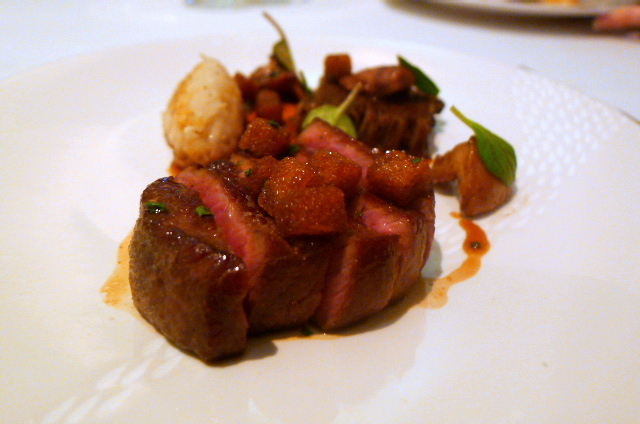 Williams’ cooking truly delighted with its skillful execution proving that he is a worthy one Michelin star holder. Each dish was elegantly presented and composed with refinement, with the highlights being the excellence of the scallop and the delicacy of the beautifully cooked cod. The seasoning was too strong in parts and this let the meal down slightly. And perhaps the sweet section didn’t strike a chord as loudly as the rest of the menu. But at the bargain price of £60, I hardly found myself complaining. This was a great meal no matter how you diced it, with really charming effusive service to boot. Prices: £50 for three courses from the a la carte menu. £60 for the tasting menu. To read Greedy Gourmet’s review, click here.